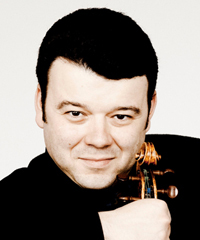 The Israeli violinist appears regularly with major orchestras such as the Chicago Symphony, Philadelphia Orchestra, London Philharmonic, Israel Philharmonic, London Symphony, Leipzig Gewandhaus, Munich Philharmonic, San Francisco Symphony, Minnesota Orchestra and NHK Symphony; and with leading conductors including Neeme Järvi, Michael Tilson Thomas, Tugan Sokhiev, Andrew Litton, Marek Janowski, Semyon Bychkov, Jukka-Pekka Saraste, Itzhak Perlman, Paavo Järvi, Rafael Frühbeck de Burgos, Hannu Lintu and Peter Oundjian. His festival appearances include Verbier, Ravinia, Lockenhaus, Pablo Casals, Colmar, Jerusalem, and the North Shore Chamber Music Festival in Northbrook, Illinois, which was founded by Gluzman and pianist Angela Yoffe, his wife and long-standing recital partner. The 2014-15 Season marks Mr. Gluzman’s first appearances with the Berlin Philharmonic and Cleveland Orchestra, performing Prokofiev’s 2nd Violin Concerto under Tugan Sokhiev, as well as with the Orchestre National de France, Netherlands Philharmonic and Orchestre National de Belgique. He will perform with the Dresden and Seoul Philharmonic Orchestras, the Bournemouth Symphony, Orquesta Sinfónica de Minería in Mexico City, and the Royal Scottish National Orchestra at the Edinburgh Festival, among others, and appear in recital in Paris, Geneva, St. Petersburg and Hamburg. Gluzman will also lead performances with the Moscow Virtuosi, Dresden Philharmonic Chamber Orchestra, and I Musici de Montreal, and will continue his collaboration with the ProMusica Chamber Orchestra in Columbus, Ohio, as Creative Partner and Principal Guest Artist. Mr. Gluzman has given live and recorded premieres of works by composers such as Giya Kancheli, Peteris Vasks, Lera Auerbach and Sofia Gubaidulina. In recent seasons, he has given the UK premieres of Michael Daugherty’s Fire and Blood concerto with the London Symphony Orchestra under Kristjan Järvi; and of Balys Dvarionas’s Violin Concerto with the BBC Symphony Orchestra conducted by Thomas Søndergard.